Big Ministires have been a BIG name bringing churches (and some schools) with 5-11 year olds together for fun, challenging, interactive, God focussed events since November 2004. Their aim is to inspire children to worship God and to live their lives in a way that reflects His nature. Through events and in co-operation with festivals such as The Big Church Day Out, the hardworking teams lead all-age worship services, training and provide excellent resources for children’s workers in every aspect of children’s ministry and mission. Part of the Big Ministries resources for your 7s to 11s, this high energy DVD matches the CD and features action packed… actions to give added power and impact to the music and in a variety of contemporary styles that kids will love and children's workers will love using. The DVD gives you actions to use with children for all 13 songs from the 'Welcome to the BIG Academy' album. Each song gets its own teaching video with an explanation of the actions, another of the the whole song with the actions and another with that AND all the actions and words on the screen. There are even alternative all-age actions or ideas for songs with more complicated actions! Big Academy celebrates the incredible story of God with 13 fantastic new songs from to sing, dance or break out your best air-guitar moves to as you worship God at home, in the car, at church or anywhere! Aimed at 7-11s but, with a wide variety of styles, there’s something for everyone. Using songs from the BIG Academy album, 12 BIG Questions is a ready-to-use Bible-based resource for use with children aged 7-11. Each session looks at a BIG question including: What is worship? Is Church important? Is God faithful? What is sin? ...and many more! 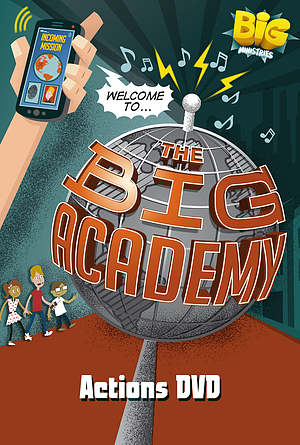 The Big Academy Actions DVD by BIG Academy was published by Elevation in July 2013 and is our 15322nd best seller. The ISBN for The Big Academy Actions DVD is ELE1961A. Be the first to review The Big Academy Actions DVD! Got a question? No problem! Just click here to ask us about The Big Academy Actions DVD. A high energy DVD from BIG Ministries featuring a variety of contemporary styles that kids will love and children's workers will love using. 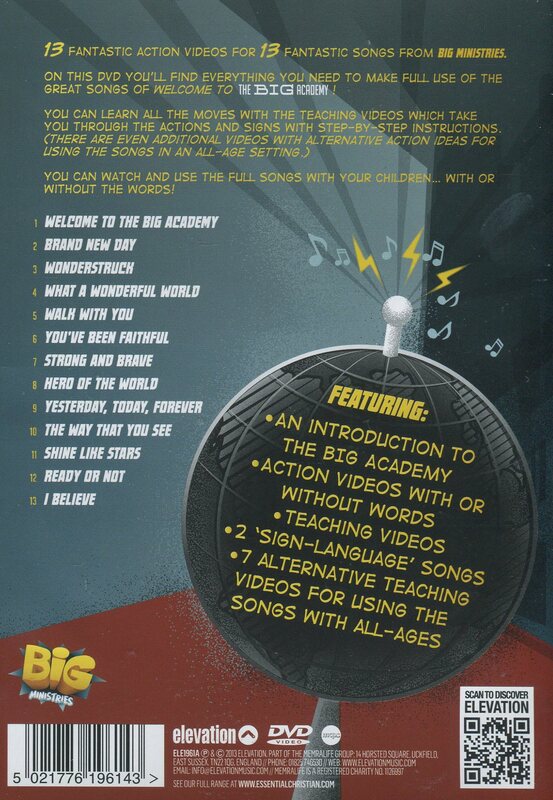 This DVD will contain actions to use with children for all 13 songs from the 'Welcome to the BIG Academy' album.